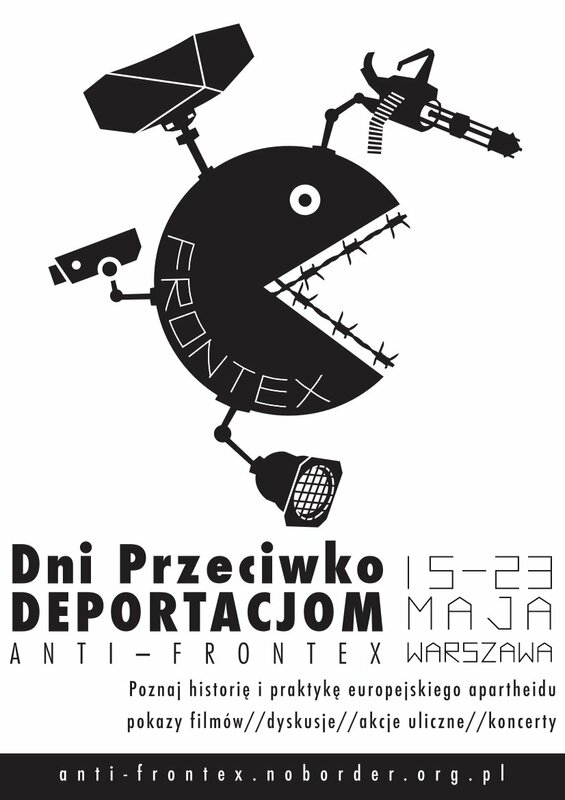 Throughout the week starting on May 16th there will be films, street games, workshops and meetings with European noborder groups, concluding on May 23rd with a demonstration in front of the Frontex offices in Warsaw. Ending oppression in Europe requires radical solidarity; this entails realising that our liberation is co-dependent. Migrants and non-alike, our freedom is bound together, and thus so must be our struggle. Frontex is the European border agency, founded in 2004 and operational since 2005. The agency has their seat in Warsaw, Poland, from where it directs its activities. 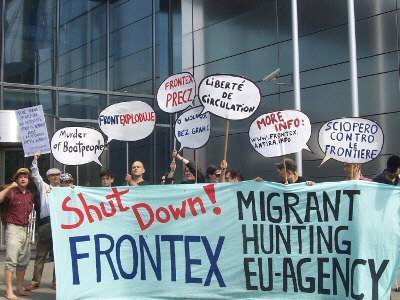 Frontex is a coordinating mechanism of the European Union organizing the cooperation of the border police bodies of the member states of the EU. In this respect, Frontex is like a meta border police: it is both above and behind the everyday practices of border guards. To this end, Frontex combines a lot of tasks and activities in one body that in the traditional nation state have been kept separate. There is an intelligence service component: Frontex actively monitors and pools data about all that is going on at the external borders of the EU, so that predictions to movements of migration can be made. Frontex refers to this as risk analysis, a whole department at the headquarters in Warsaw is busy with this and well connected to its national counterparts in Europe. There is also a research division, which – in cooperation with military industries and universities – pushes for the high-tech-sci-fi border of the 21st century. Current plans include real-time surveillance of the border on all levels, including live satellite imagery, the use of unmanned aerial vehicles (UAV aka drones, usually deployed in war zones like Afghanistan and Iraq) for close-ups, and all other tools at the disposal of a border guard: radar, cameras, etc. Another project is the introduction of biometric identity checks at all border crossings. The main focus of Frontex, however, is the coordination of cooperation at the actual border, as they refer to it. Since the agency became operational, Frontex has organized so called “joint operations”, in which EU member states invite other EU member states to send border guard personal and equipment for a joint policing of the borders. Recently, Frontex has also been more involved in the organization and financing of mass deportations, where a whole plane is chartered and refugees from all over Europe are collectively deported to their assumed countries of origin. In 2009, Frontex did more than 30 such flights, removing more than 1.500 people from European territory. 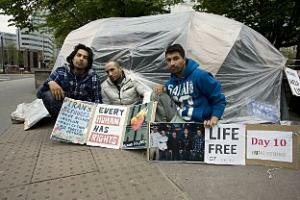 Six Iranians have been on hunger strike in London and Croydon since 05/04/2011 after being refused political asylum in Britain, having escaped imprisonment, torture, and threat of death in Iran. Though their lives will be in danger should they return to Iran, they have been ignored, dismissed and let down by UK authorities since they sought refuge in this country last year. Facing deportation, they decided to take drastic action: four of them have sewn their mouths together in protest; by Friday all will have gone 32 days without food. They have been camping outside the UK Border Agency (UKBA) headquarters in Croydon, and Amnesty International in Clerkenwell. Their case highlights the rotten state of the UK asylum system. Rather than support refugees, the UK Border Agency operates a systematic policy of disbelief: ignore, confuse, use every legal loophole to refuse asylum claims and keep the numbers down. Demo in solidarity with the hunger strikers! The hunger strikers will be attending in wheelchairs. Bring banners, drums, music, and passion.